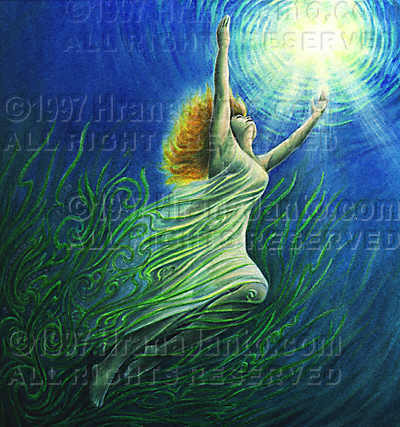 I painted Sulis in 1996 for the Goddess Oracle. She is the cover of the English & Dutch editions. The ancient British goddess of healing waters had her special shrine at the spa we call Bath, where her power was strongest. Some scholars say that she was a solar divinity, deriving her name from the word that means "sun" and "eye." This interpretation may account for the perpetual fires at her shrines; the fact that her springs were hot, rather than cold, is additional evidence in favor of considering her a sun goddess. She was honored into historic times; the Roman occupiers called her Minerva Medica ("healing Minerva"); occasionally she is called Sulivia. In statuary and bas-reliefs, she was shown as a matronly woman in heavy garments with a hat made of a bear's head and her foot resting on a fat little owl. In Bath and on the continent, she also appears in multiple form, as the tripartate Suliviae. The latter name is also used of the pan-Celtic divinity Brigid, suggesting a connection between these figures.